Soon there will be a sign on this former church announcing the building’s move and asking for donations for its planned restoration as a community center. The mayor’s work group on historic Albany properties is making headway on its two projects: moving and restoring the former Cumberland Presbyterian Church and contacting the Postal Service about finding another site for its downtown post office. Regarding the old church, at Main Street and Santiam Road, the group on Monday agreed on the next steps in moving it to a vacant spot off Santiam Road near Hackleman Park: Refine a site plan, firm up a preliminary cost estimate of $200,000 for the move and site work, then get city council approval in late August of the plan plus a funding scheme. Unless there are snags, the building may be moved in October. Once it’s moved and secured, the city would start a “community dialogue” about the building’s use, followed by fundraising and construction. The work group settled, at least for now, on a name for the place: Cumberland Community Center. The city council more or less signed off on the process at a work session later in the afternoon. Councilors Mike Sykes and Rich Kellum said they don’t want taxpayer funds to be spent on the project. 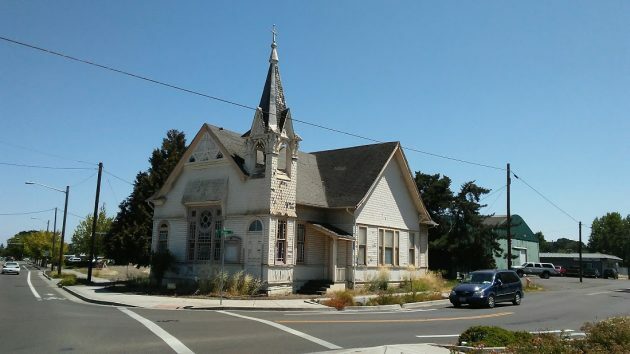 Street funds may be used to front the costs of the move, to be reimbursed when the city sells the former church site. The city bought the property in 2000 with $150,000 in street funds for a project that then didn’t need it. On the post office, the work group agreed now is the time to send out feelers whether the Postal Service higher-ups in Portland would even entertain proposals to give up the Albany site they own for another as long as it would not cost the service anything and might even save it money. A “fishing expedition,” Councilman Mike Sykes called it. The work group has been talking about having somebody build or remodel a new post office — at a couple of possible locations off Pacific Boulevard — and then get the post office to move there. Various members of the group have visions that the post office block at Second and Washington, across First from the new Albany Carousel, could be developed either as a parking lot or some more interesting downtown attraction, perhaps even a private enterprise that would generate property tax. 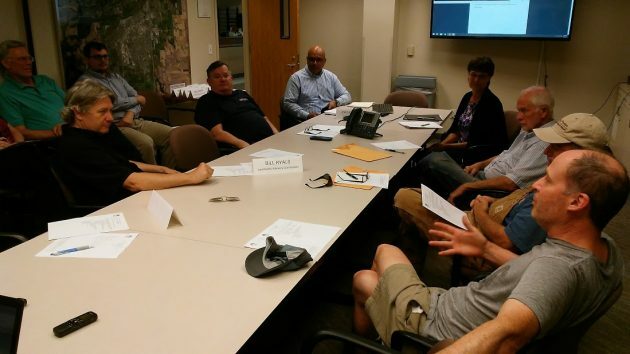 The mayor’s work group at work on Monday at City Hall. Hummmm..puzzling remark by Kellum. “Don’t want taxpayers funds to be spent….” It’s never been a problem in the past with him dolling out CARA money on projects!! Those are taxpayers funds also. I can’t fault Skyes as he’s a newbie & can be mislead until he gets some experience. I’ll break with my past opinions & lean towards having CARA money be spent. Done right the community center wold be a welcome addition to a now vacant lot. Leave the road work money where it’s at. At least it keeps the mayor and council busy, thus preventing them from raising taxes or “fees.” Just one word: don’t “entertain” thoughts of spending tax money to do either one of these unnecessary projects. Ok If I have this straight this committee would take money from the street fund (don’t we have streets that need repair), use it to move the old church to a maybe place then sell the land and return the money to the street fund. What if the land doesn’t sell for the same amount that was “borrowed” from the street fund. How long will it take to sell it and what will be done about the streets in the meantime? Did anyone on this committee think of putting the property up for sale with the stipulation that there would be a minimum bid of $200,000 and after closure the City would have a stated time to remove the building? Streets get worked on, they get their building and everyone lives happily ever after. I don’t think many people would “borrow” money from a fund they had started to replace a leaky roof so they could take a month long vacation believing they could come home and have a garage sale that would guarantee the return of what they had borrowed. How about some really innovative ideas from the members of the committee rather than using money that could and should be used for its originally intended purpose!!! !